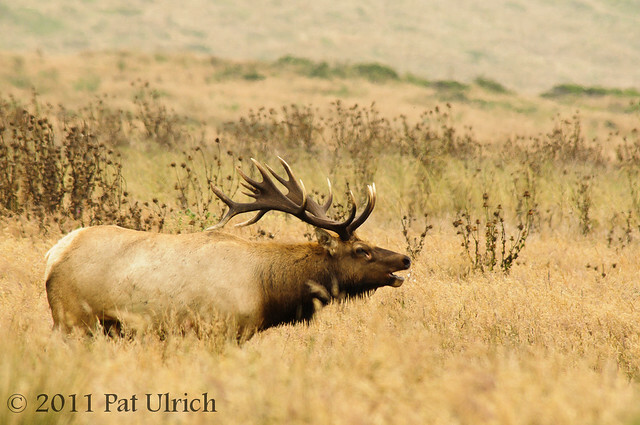 The tule elk rut is in full swing in Point Reyes National Seashore. I started my day with an early morning hike along Limantour Spit, but I again saw very few shorebirds. So since it was still early by the time I was back in my car, I decided to take a trip up to Tomales Point to check on the tule elk. Unfortunately, the fog was so thick that I could barely see the bushes just a few feet outside my window. So instead of taking a hike through pea soup (I've done that enough times in the elk reserve to know that it's just not photographically worth it), I decided to take a drive out to the outer peninsula. I saw some elegant terns on Drake's Beach last week, so I thought perhaps I could find them (or maybe some shorebirds) there as a consolation prize. Instead, I was treated to a fantastic display from the free-ranging tule elk herd. There are often elk near the turn off to Drake's Beach, but they are not often so close to the road. It was a real treat to park the car and spend some time watching three separate harems on the hillside. The largest harem belonged to this very large bull, and although he was moving with a substantial limp from one of his back legs, he was still bugling loudly, chasing off rivals (no antler-locking fights while I was there though), and mating with his females. He was a truly impressive specimen, and it's always fun to see that slightly crazed look in his eye that you see this time of year. In this shot, he is bugling loudly across the valley, and it was fun to hear the other bulls answer him back. Since I was hearing multiple responses to his calls, it was also nice to know that there were more elk just down the road. View more images of these majestic animals in my Tule Elk Gallery. Your story and the accompanying photo is making me think I need to take a trip out to Point Reyes again sometime soon. Very nice. Man, elk are some of my favorite to photograph. I've seen remnants of bugling in winter time, but nothing like the real thing. I can't wait for fall in full swing. Great shot, must have been a real treat! That time of year already? Nice! I look at your photo and hear the bugle almost like I was there. I think your ready to go knocking on National Geographic's door again. This picture has it all, Color, focus, depth, composition, context, and a whole lotta soul! It is a masters class. Great narrative too Pat! Cheers!